Route 35 in Montana made me homesick. I was savoring the passenger seat of a friend’s car as we headed towards Glacier National Park, where the rain would ultimately deter us from camping and send us to the small town of Whitefish 25 miles southwest. Trees shot up out of the expanse as we skirted Flathead Lake, and I could have sworn we were driving through the wooded backroads of my hometown in Connecticut. Nostalgia pulled at the inside of my mouth like bittersweet candy. Many people have asked me if it gets lonely traveling alone, and my answer has always been no. 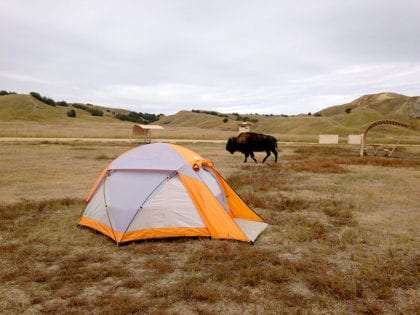 Since leaving home, I’ve pined for my family, friends, and that New England red that’s missing from fall foliage everywhere else, but aside from three days with only a few distant bison for company in Badlands National Park, I haven’t felt much loneliness – in fact, I was lonelier before I left. This coming January would have marked five years of living by myself in a one-bedroom apartment in a city I no longer felt connected to. Most of my work days were spent on my own, writing at my desk or pulling weeds in unpeopled flower beds. My life was structured for aloneness. This trip, on the other hand, was built around people. Rather than racking up bills at hotels, I’ve asked to stay on couches and in hammocks, tents, and guest rooms. I planned each destination with a reunion in mind, or with the intention of discovering a place a loved one had left a part of themselves in. In Vermont, one of my mom’s oldest friends drove me by the cornfield I had gotten lost in as a little girl. I stopped in Maine to spend time with a friend and his fiancée on their farm, a visit I had been putting off for years. In the Adirondacks, I returned to Lake Placid Brewery, where the memory of the colossal Ubu Ale-induced hangover I earned on a weekend trip with friends the year before still felt too recent for anything other than a Pilsner. In Chicago and Seattle, I reminisced over decade-gone debauchery with people I met as a college student abroad in Australia. I have endured a good amount of gritty, solitary pavement time – the 10 hours between the Badlands and Bozeman, Montana, the teary three-and-a-half hour drive to Pittsburgh post-fender bender, a few nights curled up in the backseat of my car in various hospital parking lots. But these stretches of aloneness have served as the stitching between times of togetherness with old friends and new, a togetherness I didn’t realize I needed until I had it.